I made a trip to the Strasburg O Scale Swap Meet with a bonus side visit to the Strasburg Museum last Saturday. I was on my way to Lebanon, PA to pick up my mom, so I didn't have a lot of time. I got to the swap meet just before it closed down and most of the folks had already struck their tables. A few vendors were still open for business. I bought some Precision Scale 33 inch wheel sets from a vendor that had a good selection of detail parts (sorry can't remember his name). The Precision Scale wheel sets are standard O Scale (i.e. 5 ft gauge) but have very short needle points on the ends of the axles. They should work well with my narrow truck design. I also picked up a P48 National B-1 Truck from Rich Yoder. I really have no need for it, but it was such a detailed model, I felt that I might learn a bit about how it was made and operates. The photo doesn't show the impressive brake rigging detail. On my way out, I stopped at the Strasburg Railroad and Museum. 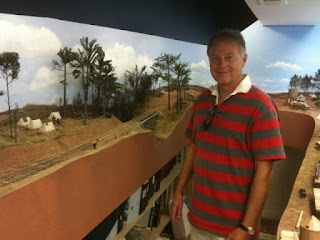 I did not go in the museum as I didn't have time, but I did get to see the tourist train arrive from one of its trips. The video below shows the train arriving and doing a run-around. This is the kit that we will be building. The wood base is not included. On November 4th and 5th I will be at the Craftsman Structure Convention in Mansfield, MA. On Friday evening I will be conducting a hands-on premium workshop on how to assemble brass kits. 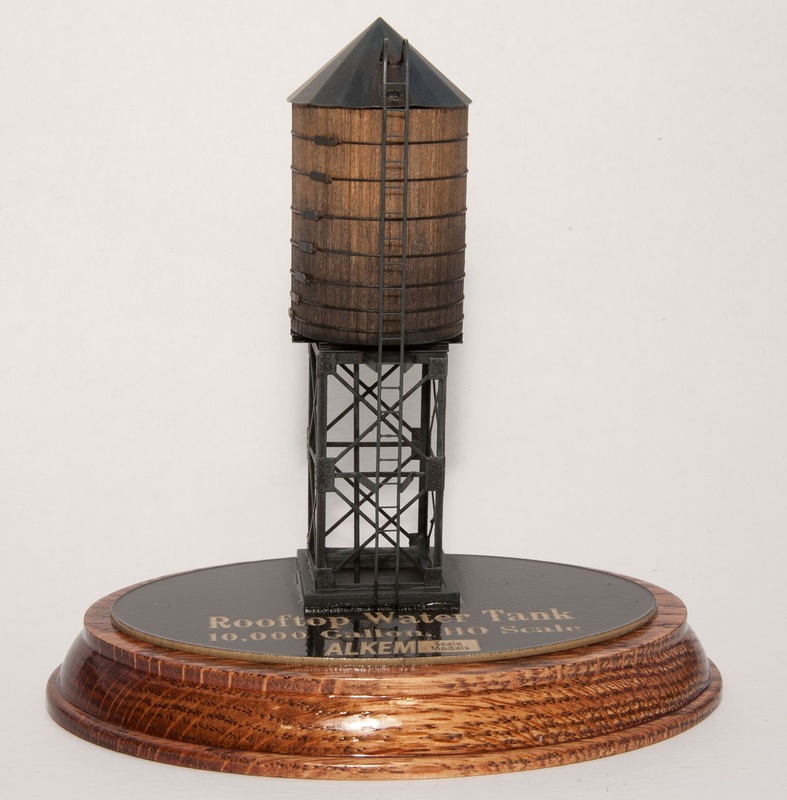 The kit we will be using is actually a mixed media kit that will depict a water tower in HO scale. 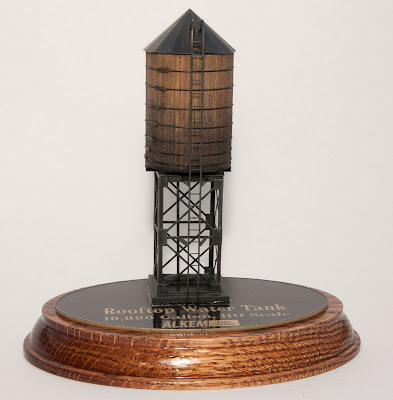 The kit includes etched brass parts and laser cut wood to make a neat model of a 10,000 gallon water tank typically used on rooftops of buildings and factories. People that attend the workshop will get to assemble a kit and take it home with them. I designed this kit specifically as an introductory kit. It should be easy to assemble, yet demonstrates the incredible detail possible with etch metal kits. The convention is free. The premium workshop costs $25, but you get a kit worth $25 to take home. If you have any interest in learning more about brass kits, plan to attend the workshop. Bring your tools and a 15W soldering iron. On Saturday, I will be presenting my Introduction to the Railroads of the Civil War. I don't have the exact time yet, but the convention folks will be posting it to their website soon, at http://www.csc11.net/ That talk will be free. I have not had much time to work on the layout, but I did have a visitor from London, Ontario, George Dutka. He and Marty McGuirk stopped by Saturday for a quick look at the layout. Unfortunately, what they really got to see was me working on the paint and room trim. George is a Central Vermont modeler who was passing through town to attend the boat show at Annapolis. While they were there, they both got to take home goodies, as we are in purge mode as a result of the flood- I realized I just have too much stuff. George got an HO box car and some laser cut shingles, while Marty go to take home the pilot model of the CV concrete coal dock complete with its own diorama. I had begun the task of correcting the engraved CV logo on the pilot model. The original kit had "stretched" the tilted rectangle. They got to see the laser in action as it engraved a new logo on the puttied-over spot on the finished model. It worked and Marty is now the proud owner of a built-up coal dock. Now if he can just get a spot on his layout for it. September and so far October have been brutal. Work on the layout has again been stalled by the outbreak of a nasty cold that struck both my wife and I. We've been under the weather for over a week now. On the bright side it allowed me to catch up on some book reading and movie watching. I watched three movies, The Expendables, Ironclad and Valkyrie. None were ACW related. Of the three I would recommend Ironclad as long as you are not squeamish. It is about the activities of King John and a band of warriors after the signing of the Magna Charta. It is loosely based on an historical event and is a good swords and castles flick. Valkyrie is a depressing look at life in Nazi Germany surrounding the plots to kill Adolph Hitler. It was well done, but not as gripping as the earlier film Downfall. The German government cooperated to an certain extent with the making of Valkyrie and they insisted on historical accuracy. It stars Tom Cruise as Col Staufenberg, the leader of the assassination effort. In a side note, Dan Snyder, the owner of the Redskins football team, is the producer. Stallone's The Expendables was pretty much a waste of time with a shallow story and cartoon violence. Don't bother. I also watched two documentaries, Beer Wars and Marwencol. Both were available on Netflix streaming. Beer Wars is an insider look at the beer business. Surprise - big business controls it - duh! Marwencol is quirky but remarkable story that left me feeling a bit melancholy. I won't tell you more as you can see for yourself. 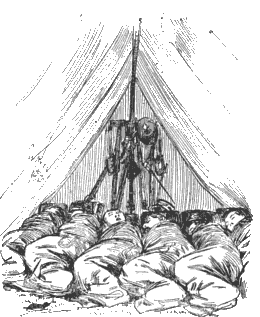 As to books, I want to recommend a neat little book called Hard Tack and Coffee: The Unwritten Story of Army Life by John Davis Billings. This book is jammed full of stories and detail about what civil war camp life was like. The illustrations and textual descriptions provide numerous great ideas for creating and detailing scenes on the layout. It is available free from Google Books here. Or you can order a bound paper copy from Amazon here. I got a copy at the local close out sale at Borders.